Okay so I am a just an incy wincy bit late with post but that's because I thought I had lost all my photos of my visit. *phew*. When I heard Cafe Ish was closing, my heart died a little as there were only days left of being able to have Cafe Ish's signature crab omelet. Not long later, exciting news had spread quickly across the twitter-verse about a new Milk Bar opening by Josh. I love old school food. It brings me back to the days when I would save up my weekly pocket money so I could spend 'luxuriously' at the school canteen. This is of course before all the strict health regulations came in. I am not the biggest fan of milkshakes to bring my boys into the yard but oh em gee... 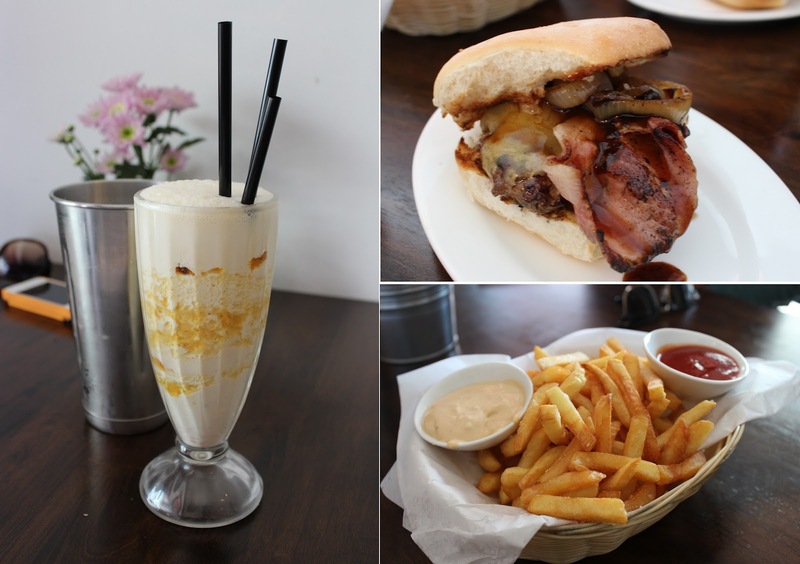 Milk Bar's milkshakes are to die for. A milkshake with coconut and macaron ice cream had me at hello! It was all levels of amazing and best of all, it made me feel like a 5 year old kid again. Milk Bar also does a delish beef burger for 5 dorras. I don't recall the last time I was able to buy food with 5 bucks besides a sushi roll. Extra toppings such as bacon or cheese are for a dollar or two more. Ai’s Freaking Awesome Chicken Wings are seriously.. freaking awesome. I had it with hot sauce the first time and crab sauce the second. I found that there was too much crab sauce on there which made it a bit too heavy for my own liking but the hot sauce was a totally different story. Freaking amazeballs, there were no other words to describe it. *breathes in so I can calm myself down whilst typing and staring at that tart* .. When the Milk Bar first opened up, I constantly saw pictures of these maltese tart again, again and again so there was no doubt that I had to get myself a slice during my visit. It looked so good that most of my friends and I took home a slice each. I cannot explain exactly how orgasmic that tart was. The moose was perfect, it was smooth but it still had some texture. The chocolate was so rich but so bloody good (and as you guys know by now, I am not the biggest chocolate fan out there). Unfortunately, as nice as it was, I struggled to finished it and yes people, can you believe I shared this baby around? Every spoonful was just as good but the slice was so gigantic! This is a must have for everyone that visits this place. That burger (the real one) looks seriously good! And cheap! Trust you to make me hungry at 10.32 at night! Amazing. That tart has my name all over it. :) Sorry about Cafe Ish but the replacement looks pretty good. lol i love that you got three slices of malteser tart to takeaway! I love the burgers here...and Ai's wings with the orignal vinegar sauce. SO GOOD! My husband doesn't work too far from here and has dropped in for lunch several times, but me...I've yet to find a chance to go myself! Still haven't made it here yet! The burgers look awesome and I seriously need to get my hands on a slice of that malteser tart! Stumbled upon your blog & I must say you've got a great food blog here. Those wings look really good! Well, I'm following u now at Pinterest & Twitter & would love to have u follow me too. Looking fwd to sharing! Love the Malteser tart. I need to get to Milk Bar soon, all the blogs I've seen covering it have made my mouth water! damn i sitll havent had time to check it out - not as convenient to head to as cafe ish was :( love the sound of all the food!